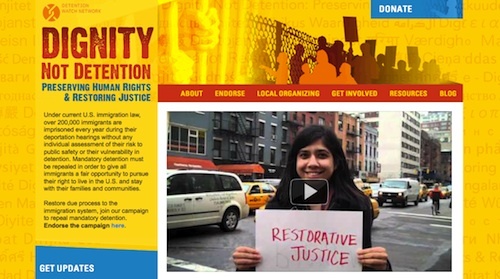 The Detention Watch Network (DWN) is a national coalition of organizations and individuals working to educate the public and policy makers about the U.S. immigration detention and deportation system and advocate for systemic reform. In 2011, DWN was gearing up for its annual conference of member groups. DWN reached out to the Center for Media Justice (CMJ) to lead a daylong session to sharpen both the communications skills of nearly 200 attendees and the overall communications strategy of the organization. The critical question they were facing: how should DWN respond to a growing mainstream immigration frame that incubates unjust immigration enforcement and incarceration policies? Many organizers had noted the shift in mainstream discourse on immigration policy. Elevating frames around “noncriminal” versus “criminal” immigrants engaged many Americans who support legalization for immigrants without criminal records. While this framing helped gain several important legislative wins, social justice organizers were concerned by the wedge effect of the “best behavior” frame. The conversation ignored disproportionate racial and class disparities in policing, incarceration, and the criminal justice and legal systems in general. Latino and black people are significantly more likely to be stopped and searched by police, and three to six times more likely to be sentenced to incarceration than their white counterparts. DWN was also concerned that their nascent efforts to build long-term relationships with criminal justice reform organizations, which are often focused on building bridges between Latino and Black communities, would be harmed if they supported the “best behavior” frame. DWN was concerned that if immigrant-rights groups excluded an entire grassroots base that had increased contact with the criminal justice system, they would not be able to effectively articulate and integrate an analysis of the system’s grave flaws. CMJ agreed to lead a critical conversation among the DWN annual conference participants on wedge framing. CMJ’s goal was not to simply create communications plans and provide media training, but to ground the groups in core concepts and frames in a way that integrated their existing work. Participants were guided through a framing and messaging training. Next, participants mapped out the primary strategic goals of the immigrant-rights sector. Participants were then broken up into small groups; each group performed an analysis of leading progressive frames on their respective issues. Participants were then asked to identify the history and context of the issue. By deliberately plotting out and overlaying sector goals, pre-existing progressive frames, and issue context, participants could examine the root causes of the framing problems at play. From there, they could begin to formulate a stronger, more effective strategy for organizational framing and messaging. Overall, the process led by CMJ opened up the space for participants to devise creative interventions at the organizational and network levels. The training and small-group work successfully engaged DWN conference participants in a deeper conversation about wedge framing. The large group discussion led by CMJ elevated possible strategic approaches to confront, dismantle, and transform wedge frames in the public discourse on immigrant detention and deportation. CMJ received excellent feedback from participants and DWN staff. Participants shared their feelings of relief and appreciation for a space to discuss the issue openly and safely in a justice sector that leaves little time to critically evaluate frames that impact their membership, and participants continue to integrate the results of the session in their communications, advocacy, and organizing work.